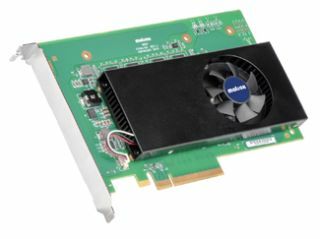 The Matrox M264 multi-channel 4:2:2 10-bit H.264 encoder card is now available from Matrox Video. The M264 is a half-length PCIe card featuring an onboard codec for multi-channel H.264 encoding/decoding quality and performance from Baseline Profile to High 10 Intra Profile up to Level 5.2. Multi-channel motion-adaptive de-interlacing and up/down/cross scaling allow content to be repurposed into any resolution before encoding or after decoding, which is particularly beneficial for OTT workflows. M264 offers the quality needed for broadcast distribution, contribution, and production applications. It encodes a single stream of 4Kp60 H.264/AVC intra-frame at 4:2:2 10-bit, up to 10 streams of HD long GOP at 4:2:2 10-bit, or up to 16 streams of HD at 4:2:0 8-bit. Presets for Sony XAVC and Panasonic AVC-Ultra formats are provided. The card is designed for low latency and offers dynamic bitrate and GOP control to allow adjustments on the fly. M264 will be featured at IBC 2015 in Amsterdam, September 11-15, on the Matrox stand 7.B29. On stand 7.A20, Vizrt will present a technology demonstration of Viz Engine that incorporates the Matrox M264 card to provide 4:2:2 10-bit H.264 contribution-quality IP playout. "Having dedicated hardware is our preferred solution for a compute-intense task like H.264 encoding," said Gerhard Lang, chief engineering officer at Vizrt. "The M264 enables H.264 streaming capabilities for our systems without influencing the overall performance. There is a multitude of use cases which can now be covered with this new building block from Matrox which fits seamlessly into our existing hardware infrastructure. We find the quality of the codec impressive too, which is right up there with x264." Alberto Cieri, senior director of sales and marketing at Matrox Video, said, "Until now, high-quality H.264 throughput has required an impossible balance of cost, quality, density, power budget, and rack space. With our new M264 accelerator card, leading broadcast OEMs are already developing systems to enable workflows that have never before been possible using a standard 1RU server."